This directory is a first-of-its-kind listing of those who support free speech on college campuses in the United States. 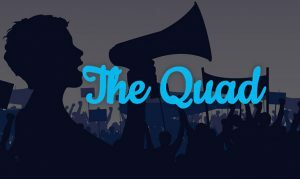 The First Amendment Center of the Freedom Forum Institute has announced the launch of The Quad, a campus free speech directory that identifies established groups, organizations, influencers and journalists whose primary missions and responsibilities focus on championing free speech across universities nationwide. The First Amendment Center, a neutral, non-partisan, non-profit organization, aims to educate Americans about how their First Amendment rights work, how they may be at risk and how they can be protected. The research used to create the directory was conducted in partnership with the Fors Marsh Group (FMG). This directory is a first-of-its-kind listing of those who support free speech on college campuses in the United States and serves as a resource for research and survey data on campus speech issues. This non-partisan resource lists entities across different political positions. The Quad also aggregates survey and poll results and compiles academic studies and scholarship relating to free speech on college campuses. “There are so many groups, from across the political spectrum, working on issues related to free speech on campuses. There are so many recent surveys on this topic, and so much research being done, that it can be hard to keep track of it all. The Quad is our attempt to consolidate all of these resources all in one place,” explained Lata Nott, executive director of the First Amendment Center. View the directory of campus organizations, peruse the list of journalists who report on speech at U.S. universities, or take a look at aggregated survey and poll results from 2016 through the present. More information about how the First Amendment works can be found on the First Amendment Center’s website. Also part of the Freedom Forum Institute, NewseumED, a free online learning platform that reaches about 12 million teachers and students around the world, additionally has First Amendment resources for teachers or professors looking to discuss the topic with students. Take a look at its latest EDCollection, Free Speech Essentials. This entry was posted in News and tagged Charles Koch Foundation, EDCollection, First Amendment Center, Free Speech Essentials, Knight Foundation, Newseum Education, NewseumED, The Quad by Freedom Forum Institute. Bookmark the permalink. Would be great to extend this directory beyond college campuses, at least to encompass all nonprofits.